Kōwhai kura: Potentilla anserinoides, & Geum urbanum (Rosaceae). See notes below. Kōwhai: From Proto Central Eastern Polynesian *Kōfai "a leguminous pod-bearing plant, especially of the genus Sesbania (Fabaceae)". Proto Central Eastern Polynesian *Kōwhai kura "A plant with special qualities" (see notes). 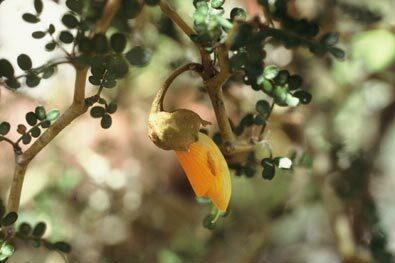 The names kōwhai and kōhai are regional variants reflecting Proto Eastern Polynesian *kofai -- there are many other Maori words similarly alternating between "wh" (originally a labio-dental fricative, but now except in the far North generally replaced by the bilabial [f], as in English) and "h" where Proto-Polynesian is thought to have had /f/. On this page we will use the variants interchangeably. The small-leaved kōwhai, Sophora microphylla, is found throughout New Zealand, but especially in North Island riparian forests. It is rare in Hawkes Bay and Northern Wairarapa, and is closely related to a number of other species which were once listed as varieties or simply subsumed under its name: S. chathamica (Chatham Islands), S. fulvida (Western areas north of Raglan), and S. longicarinata (a multi-trunked species which grows at the top of the South Island). 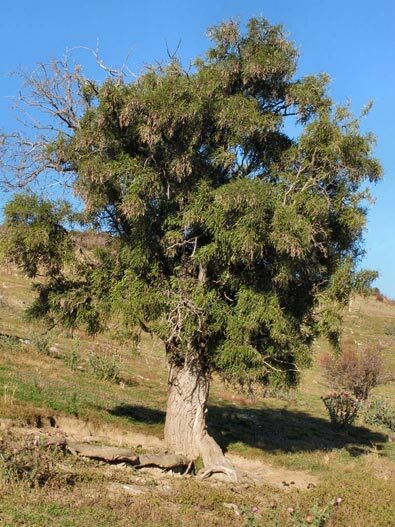 In	2001	two new species were described: Sophora molloyi, a small tree which grrows up to 3 m. tall in the Cook Strait area, and S. godleyi, a gracious tree with a weeping habit, native to the Central North Island. Closely related species also grow in Chile and Rapanui (Easter Island). These may all have a common origin, as the seeds are carried by ocean currents and according to Dawson and Lucas can remain viable in sea water for over ten years. Another species, Sophora prostrata, has been grouped with both S. microphylla and S. tetraptera (more about the latter further down the page). This retains its juvenile jumbled branching habit into maturity, and grows to about two metres high in its native habitat in the eastern South Island. Mature trees of Sophora microphylla can be up to 20 m tall with (usually single) trunks up to 60 cm in diameter. When young they are divaricating shrubs with tangled branches. 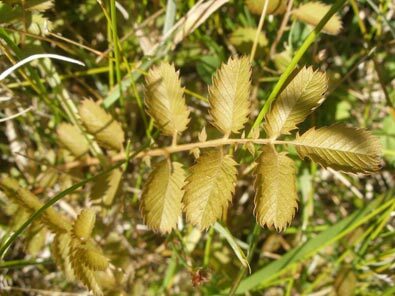 The leaves are 3-5 cm long with leaflets about 5-12.5 mm long. The large, bright yellow flowers are rich in nectar and are favourite feeding stations for tūī. They are produced abundantly in the Spring. The seeds are enclosed in separate compartments in the pods, which (unlike those of many other leguminous plants) do not open to release them. Some will be liberated by birds, but others will have to wait until the pod decays after falling from the tree. Sophora tetraptera is the other widely distributed species of kōwai. It is found naturally in the Eastern and Central North Island. It has much longer and bigger leaves than S. microphylla -- 10-30 cm long, with leaflets 15-40 mm long. It can grow up to 15 m high, usually with several trunks. The juvenile forms are not divaricating, so they are easily distinguished from young S. microphylla. It flowers in the Spring and early summer. All parts of the plant are poisonous, the seed especially so, but fortunately the tough shells make them hard to chew. Tuis love feasting on the young leaves in Springtime, and according to Murdoch Riley "it is known that people who have eaten the flesh of the kūkupa, or native pigeon, after it has been gorging on the plants, have got violent headaches". Since the kūkupa (also known as kererū) is totally protected bird, one might say that the eaters have received their just deserts! 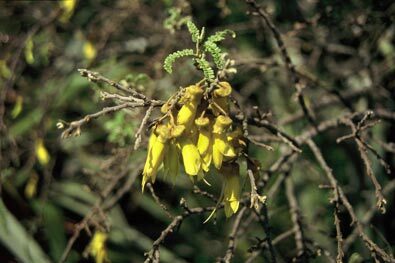 A clear yellow dye can be extracted from the flowers of all kōwhai, and pale yellow dyes from the seed pods. The name of the plant therefore functions metaphorically as a word for "yellow". Although possibly poisonous if ingested, the bark and also the leaves have been used medicinally for treating wounds of various kinds. 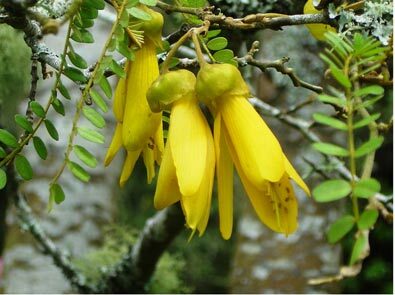 There are also accounts of decoctions of kōwhai bark being used internally as a purgative, or even to cure colds and sore throats and treat shingles (M. Riley, Herbal, pp.245-6). The kōwhai ngutu kākā, Clianthus puniceus and C. maximus (Papillionaceae, a division of the Fabaceae), owe their Māori and English common names to the resemblence of their crimson (and occasionally white) flowers to the beak of a native parrot. Both species are rare in the wild -- C. puniceus (illustrated in a photograph by Gillian Crowcroft on the left) is virtually extinct -- but are widely cultivated. 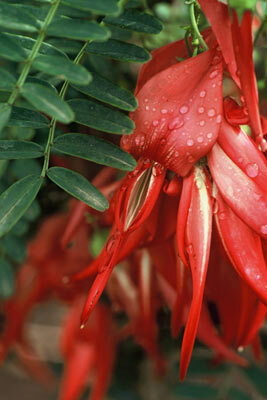 They are one of the few plants which were cultivated by Māori for their ornamental rather than their practical value. Clianthus puniceus is thought to have been endemic to Northland, and C. maximus to the East Coast and Northern Hawkes Bay. Since the 1990s, commercial nurseries have been promoting cultivars of Clianthus maximus, which is more disease and pest resistant than C. puniceus, and Peter de Lange notes in the NZPCN profile of this plant that the remnants of some wild populations of the latter formerly propagated commercially may have died out as a result in this change of emphasis. 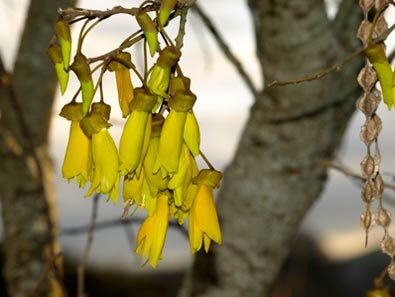 Like the kōwhai and the harakeke, the flowers of the kōwhai ngutu kākā are pollinated by birds. Once found wild along the East Coast from the Bay of Islands to Tolaga Bay and inland around Waikaremoana, it has been the victim of introduced pests: snails can defoliate a large plant in a single night (as indeed has happened in Te Māra Reo -- a few years ago I removed 400 snails from a single plant in one evening). The individual trees generally live for only four or five years, and although they seed readily and also grow easily from cuttings, mice and snails can wipe out seedlings and young plants, so even in cultivation vigilance, though rewarded, is essential to ensure their security. The plants are also attacked by leaf-mining insects and a number of fungal diseases. Clianthis puniceus normally has bright red or deep pink flowers, about 80 mm long, with a white-flowered variety occasionally found. The flowers of C. maximus are slightly larger and an even brighter red. I te pītau tutu, i te kōwhai ka ngaora. 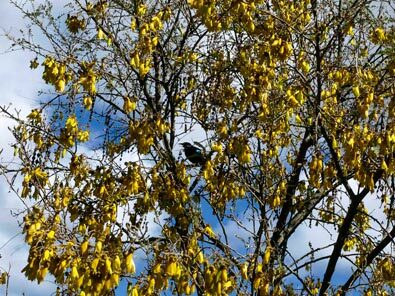 The kōwhai also appears in a few idioms and proverbial sayings: He ua kōwhai "A Spring shower" (literally "a kōwhai rain"), the promise of renewed food resources and warmer weather. Similarly, Ko te ao o te kōwhai "the budding of the kōwhai" refers to Springtime; the tui and the pīpīwharauroa arrive and the kina are ready for harvesting (M&G 1533); this leads on to the question I hea koe i te ao o te kōwhai? (M&G 878) or I whea koe i te matikaotanga o te kōwhai? 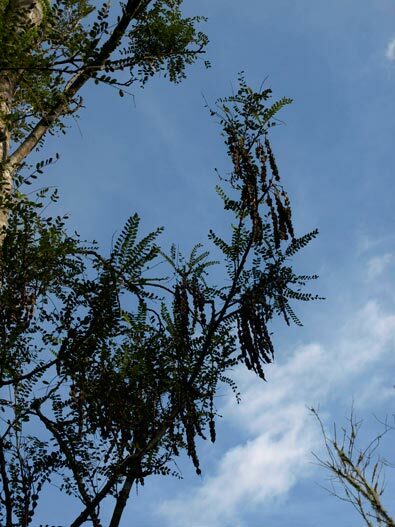 (M&G 914) "Where were you when the kōwhai was in bud? ", i.e. when the work of preparation for the coming year needed to be done. Probably the Māori translators used kōwhai in this case to indicate what is interpreted as "mother-of-pearl" in some of the English translations. As a tree name, kōwhai makes a single appearance, in a very interesting passage in Isaiah/Ihaia (41:19), where it is translated as "acacia". There is a detailed discussion of this verse in the page for Ramarama. Follow the link to read it! These plants are undoubtedly identical with the same species of New Zealand, the geum urbanum and potentilla anserina [sic]. These plants were used in the olden days for the purpose of scenting the fine, prepared coconut oil. 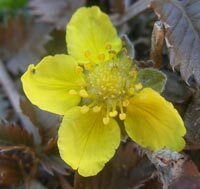 I suspect that the kōwhai in this name relates to the yellow colour of the flowers of Potentilla anserinoides (inset) and Geum urbanum (in the gallery below), although the leaves of the Potentilla (photograph below) do have a vague similarity to those of the leguminous kōwhai. The "kura" is also probably a metaphorical extension of that word, meaning "valuable" or "precious" rather than "red". There is no doubt however about the status of the Hawaiian 'ohai 'ula as both a leguminous pod-bearer and being red-flowered. 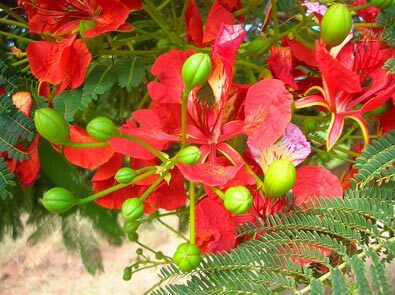 However the flame tree, (Delonix regia), is not native to Hawaii, and so the name will be of comparatively recent coinage. In the absence of any clearly identified pre-nineteenth century parallel plant name elsewhere in Polynesia, it is probable therefore that although the Hawaiian and Māori names are built from the same inherited elements, they are independent inventions, and not derived directly from a common ancestral term. The flame tree is interesting as a legume which does not have nitrogen-fixing nodules on its roots. Its large scarlet or orange-red flowers make it a spectacular sight when in bloom (in Aotearoa it grows well, sometimes too well, in Auckland and Northland). The flowers are followed by long, wide pods (up to 60 cm by 5 cm) which are quite woody when mature. It is actually a native of Madagascar, but is now widely distributed in warmer climates and makes a striking ornamental or shade tree. According to Wagner et al. it was introduced into Hawaii in 1855, probably by the eminent botanist W. Hillebrand. References and further reading: There is information about all these species on the NZ Plant Conservation Network web site. The establishment of varieties of kōwhai formerly linked to Sophora microphylla as separate species is outlined in a paper by P.B. Heenan et al., 2001, which also formally describes two new local species of Sophora. Murdoch Riley has interesting accounts of Arawa traditions concerning the origin of the kōwhai and its bright yellow flowers in his Herbal (p.242). For futher information about S. microphylla and S. tetraptera see Laing and Blackwell's Plants of New Zealand, Lucas and Dawson Guide to the NZ Forest, and other general works on NZ trees listed (along with the works mentioned above) in the bibliography. 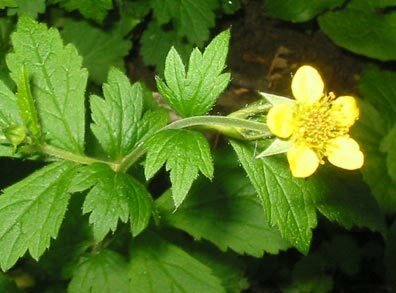 There	are profiles of Potentilla anserinoides and Geum urbanum on the NZPCN web site. The NZPCN site also has highly informative profiles by Peter de Lange of Clianthus puniceus and C. maximus. Photographs: Once again we are indebted to members of the NZ Plant Conservation Network for permission to use their photographs of various plants, in this case Gillian Crowcroft (Clianthus puniceus), John Barkla (Sophora microphylla tree), John Sawyer (Potentilla anserinoides), Peter de Lange (Sophora prostrata and S. fulvida), and Wayne Bennett (S. microphylla flowers). Kim and Forest Starr (Starr Environmental) provided the photograph of Delonix regia. The photograph of Geum urbanum is by "Bogdan" via Wikipedia. Other photographs are by RB, Te Māra Reo.